With the wave soldering system PowerWave, SEHO consequently realized a machine concept which offers a remarkable performance at simultaneously low investment costs. Complex SMD boards are as reliably soldered as conventional assemblies - due to up-to-date solder nozzle geometries and a flexible preheat area. The modular construction of SEHO PowerWave offers the ideal concept for all production requirements and allows the machine to be integrated into existing fully automated production lines. Performance reserves for the user have been created with the high performance pre-heating. 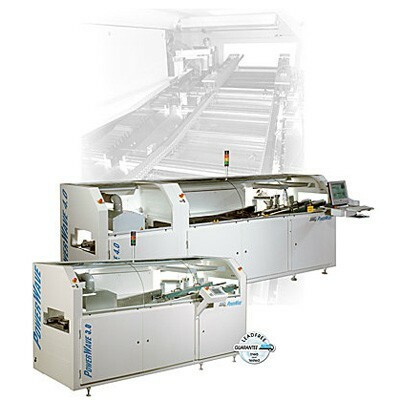 SEHO PowerWave is available with either 1200 mm preheat length or 1800 mm. Depending on your production requirements, SEHO PowerWave may be equipped with a chain/finger conveyor system or with a solder frame conveyor for the processing of pallets. The heart of the machine, the soldering area, is designed with a degree of flexibility that may perform all realistic soldering operations. Modern and innovative solder nozzle geometries provide ideal soldering results.